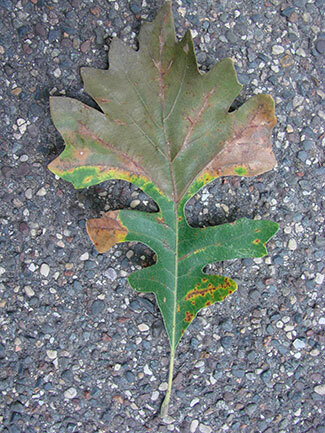 Bur oak blight (BOB) is a fungal leaf disease that gained attention in Minnesota and Iowa in the mid-to-late-2000s, although Minnesota DNR Forest Health staff noticed symptoms in the 1990s before scientists identified the cause. BOB causes leaf browning and leaf loss in late summer and early fall. 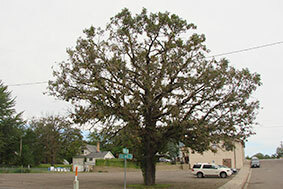 It affects only the small-acorn variety of bur oak (Quercus macrocarpa var. oliviformis). Unfortunately, that’s the one variety we have in Minnesota. BOB is caused by a native fungal pathogen, Tubakia iowensis, which likely has been intensified by above-average spring rainfall since the 1990s. Wedge-shaped leaf death (tip of leaf) and leaf vein browning (bottom right of leaf) are telltale signs of BOB. Bur oak showing extreme sign of BOB. Since BOB is a relatively new phenomenon, we don't yet know its long-term impact to Minnesota. 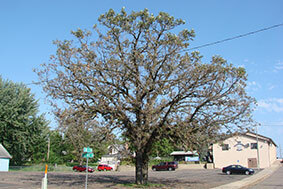 In a 2017 survey of 400 bur oaks in central and southern Minnesota, surveyors found BOB heavily defoliated an average of two percent of bur oaks by early October. A smaller number of oaks were heavily impacted in 2018. 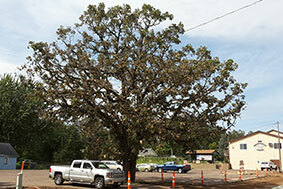 BOB can have a severe impact on individual bur oaks, but not all bur oaks are affected by it. It’s important to remember that bur oaks can lose up to 50 percent of their canopies every year but still remain relatively healthy. However, when a bur oak loses more than half its leaves for several consecutive years, it may become stressed and susceptible to other problems, such as twolined chestnut borer and Armillaria root disease. Still, even when a bur oak has had severe BOB, it may be relatively healthy. 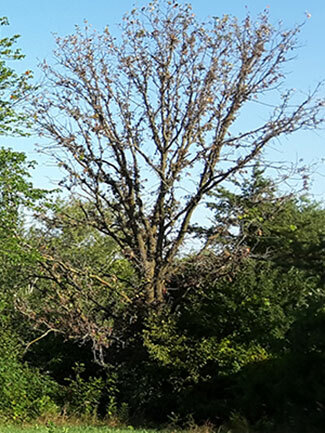 The best time to evaluate bur oak health is in June: if the tree does not have branch dieback or epicormic shoots (small, young branches growing out of the trunk and big limbs), it is probably not stressed. BOB can be found wherever bur oak grows in Minnesota.